I am not really a reviewer so I am stopping short of calling this a book review – and in any case, it concerns five books at least so we’d be here all day. Instead, I’m going to just talk about two indie authors – one American, the other British – both of whom write about relationships in a way that takes the reader right inside the characters, following every introspective argument, uncertainty, dilemma, and impactful resolution. Beyond that, they are chalk and cheese. Cathryn Grant writes suburban noir and introduces me to people with whom I have nothing in common but nevertheless gets me engaged with them within minutes. Linda MacDonald writes about the midlife crises of people whose life-styles are familiar to me – I’m interested because I know people like this and I want to see how things work out for them. Both writers show a knowledge of how people work that is almost alarming, and do this justice by their minutely focused attention to detail. And that’s where the similarities end: the one is utterly American and the other so quintessentially British, her novels all but come with an order of fresh-cut cucumber sandwiches. Cathryn writes intricately plotted novels featuring different sets of characters. You know something bad is going to happen but you don’t know what, and when it does, the page-turning comes from watching the characters’ interplay and gradual dissolution. Cathryn’s people start out glossy and perfect and are slowly deconstructed by the events in their lives; every step believable – if sometimes yell-at-the-page-dumb – with nothing coming out of the blue. Pay attention; with the odd exception, everything is significant. Demise of the Soccer Moms has an intricate and tightly written plot centred on three main characters; women whose daughters play for the school soccer team. Each of them has baggage that underpins their actions so that, bizarre and irrational as they increasingly become, there is no point reached of inconsistent absurdity. They do what they do because they are what they are. 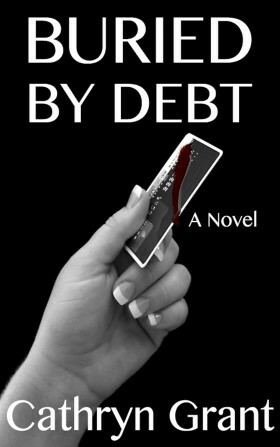 Yesterday, I finished Buried by Debt, this time fully aware before I began of how the seeming perfections of the characters’ lives would be unravelled, their insecurities slowly revealed through their internal dialogues so that each step they took – as infuriatingly stupid as it might seem – had a fully-fledged logic to it. It begins simply enough: an economic down-turn, credit maxed out in anticipation of a promotion that is delayed, and misplaced pride leading to cover-ups and lies. Again, I wanted to slap these people with their affluent and superficial lifestyles, their lack of personal depth, and their inability to see much beyond their own needs; and again I was convinced by the sound psychology of them. The outcome is avoidable and also inevitable although, being a noir, there’s no predicting those last scenes. I have just begun The Suburban Abyss and now that I am fully trained in the Grant experience, I am flicking my kindle pages with enthusiastic anticipation of how Brian and the pit behind his house are going to impact on each other. Linda mines a very different seam of social realism which, like Cathryn’s, exists in a microcosm, set this time in the UK. These characters are middle England, middle class, middle aged people who, elsewhere, are often the focus of comedy but rarely sympathetic emotional dissection. There is nothing grandiose, the course of events is unpredictable, and the plot – if what happens can be described as such – concerns the picking through of convoluted and entangled relationships rather than a build to a genre conclusion. To read Meeting Lydia is to sit in a comfy front room with the author, and listen while she tells you the story. Linda MacDonald is a raconteur, an ‘under-the-banyan-tree’, book-at-bedtime story teller, who conjures up complex images through a stream-of-consciousness narrative. I also declared an interest: I have known Linda since we were at college together in 1975 and was party to Lydia’s gestation. I recognise the sources for some of the characters and I know where many of the situations originate. This is a disadvantage to me as a reader and certainly as a reviewer – I know more than other readers and I don’t know how much sense some of these things make to the people who come to the novels fresh. Probably quite a bit, unfettered as they are by personal context. I enjoyed Lydia and went on then to read A Meeting of a Different Kind which is a standalone novel set in the same world but with different key characters; the originals having less prominence. Time has moved on, the internet has evolved, and the relationships of all the players are in a state of flux. Again, loyalties, marital conflicts, fidelity, and the uncertainties of social interpretation are key features, and again where the story ends up is less important than how it ends up there. If you are a man who doesn’t know how women think – this, like Lydia, is the book for you. If you are a woman unsure of how men think, ditto. And I should mention the menopause because it is almost a character in itself – driving the fears, flamboyances, and indiscretions of people who are, in all key respects, good folk trying to get on with life the best way possible. This theme is maintained in Alone Alternative. We are up to date; the London Olympics, twitter, Facebook and a number of other contemporary references lock in the context, and Marianne is a post-menopausal fifty-something retiring from teaching and writing a novel. There is no obvious plot – this is about the people not an undercurrent of crime or mystery or even romance – and the outcome is always in doubt. With characters up to no good and threatening to wreak havoc, there is no settling back and enjoying the ride in anticipation of an eventual smooth resolution. Unusually though there is a sense of the snake swallowing its own tail in that Marianne talks a lot about her novel, which is called ‘Lydia’ and also spends some time in discussions about it being fiction. If you like crossover TV – the sort where the cast of CSI turn up in an episode of LA Law – then you’ll like this multiple mirror effect and getting your head around the reflections. If you don’t, try to ignore it – the deeply observed psychology of the characters will see you through. Ditto the occasionally teachy environmental messages; that might be just me. The writing is unique and the insights well-founded – you won’t be wasting your time. Two authors, two very different approaches to the same thing – the dissection of human nature through stream of consciousness introspection, and the kinds of analysis many of us get into when we are trying to understand someone else’s head without necessarily understanding our own. I understand how you feel, I’m not a book reviewer either, but definitely like to express my thoughts when I finish reading a book. There’s an art – or maybe even a formula – to reviews that I haven’t got. I’m a little hesitant to acquire it too, in case it interferes with my expression and integrity. I suppose that’s up to me ultimately though. Anyway, I’m pleased you like the ‘review’ – I certainly like the books!